primary impediment to individuals looking to join the fire service. 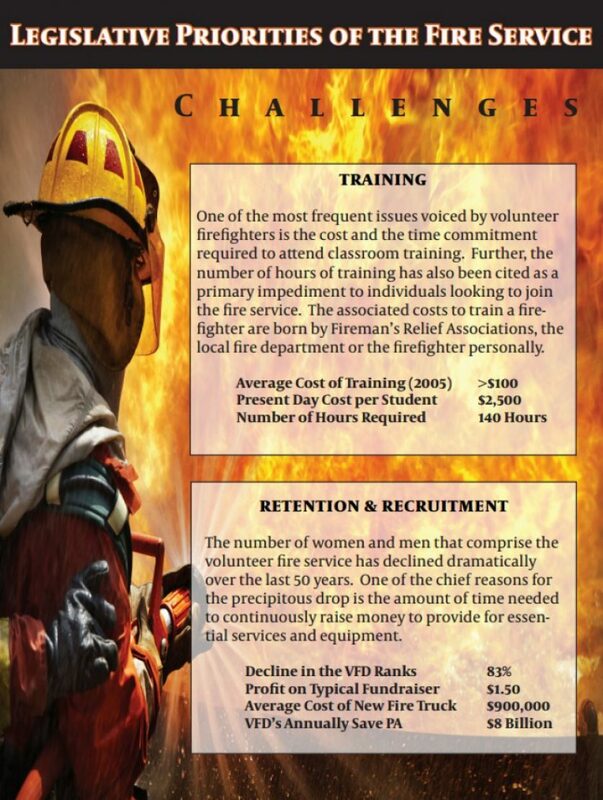 The associated costs to train a fire-fighter are born by Fireman’s Relief Associations, the local fire department or the firefighter personally. to continuously raise money to provide for essen-tial services and equipment. The Chairmen of the Senate and House Veteran’s Affairs and Emergency Pre-paredness Committee advanced an initiative last year to “reboot” previous efforts (through Senate Resolution 60 – 2003) to continue to address the challenges of the fire and emergency services. Through the imput of various stakeholders, a con-current resolution (SR 6) was drafted and a package of initaitives was identifed as priorities for the 2016-2017 legislative session. Both volunteer firefighter relief associations (VFRA’s) and paid firefighters re-ceive money from a 2% tax on homeowner insurance policies issued by out-of-state insurance providers. By increasing the percentage by 0.5%, an additional $17 million could be realized, and if increased by 1% the total would be $34 million. The average homeowner insurance policy is $660, which would increase by $3.30 and $6.60 respectively on an annual basis if the increase were enacted.